Luis Suarez will train with his Barcelona teammates on Friday after his ban for biting an opponent at the World Cup was softened but not shortened. The Court of Arbitration for Sport ruled Thursday that the Uruguay forward, who recently left Liverpool for Barcelona, deserves his four-month ban from playing official matches for both his club and his country. CAS did, however, clear Suarez to start training with his club, and Barcelona said he will join practice for the upcoming season today, and have his formal introduction to the media and fans on Tuesday. He could play in a club friendly on Monday. Suarez bit Italy defender Giorgio Chiellini’s shoulder during Uruguay’s 1-0 win at the World Cup on June 24. He denied it at first, but later admitted it and apologized within days. “The sanctions imposed on the player were generally proportionate to the offense committed,” the court said in a statement. 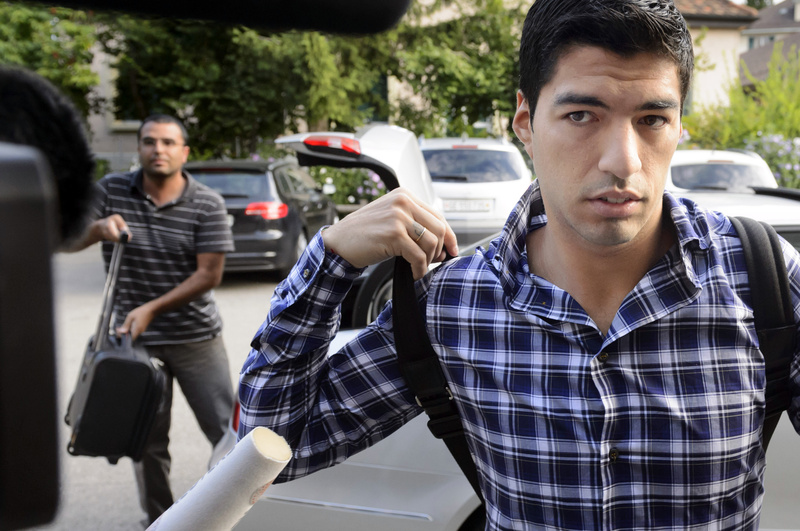 Suarez can next play a competitive match on Oct. 25, and it should be worth watching. Barca has an away match against Real Madrid that weekend, the first clasico of the Spanish league season. Suarez remains banned for Uruguay’s next eight competitive matches and will miss next year’s Copa America and some World Cup qualifying matches. Still, the court confirmed he is allowed to play non-competition friendly matches. On Monday, Suarez could make his Barcelona debut against Mexican club Leon at Camp Nou.